Take, eat; this is in remembrance of my body which I give a ransom for you (Matt. 26:26, including footnote b). When you want to remember something important, you might write yourself a note or tie a string on your finger. To remember someone who has been gone for a long time, you might look at his picture or read something he wrote. To remember a song or poem you’ve learned, you might sing or recite it often. Jesus gave us the sacrament to help us remember the sacrifice He made for us in the Garden of Gethsemane and on the cross. He suffered for our sins so that we could be forgiven if we repent. He gave His life and took it up again so that we could be resurrected and live again. The sacrament bread represents Jesus’ body, and the water represents His blood, which was shed for us. When we take the sacrament, we renew the covenants made at baptism: We are willing to take His name upon us as members of The Church of Jesus Christ of Latter-day Saints, we will always remember Him, and we will keep His commandments. 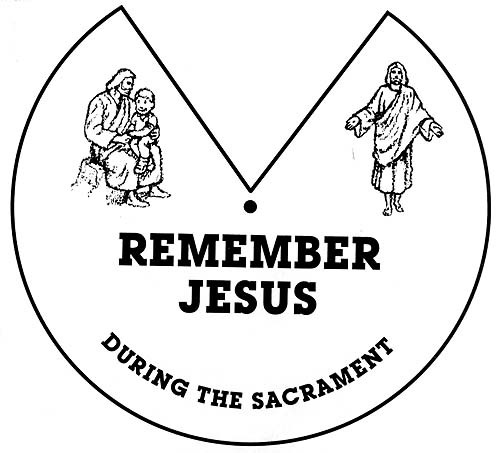 There are many ways we can reverently remember Jesus, especially while the sacrament is being passed. We can remember how He suffered for our sins and how He died and was resurrected. We can remember His life and teachings and think about how we can become more like Him. We can remember the things we have done wrong, repent, and ask for forgiveness. We can remember the many blessings He has given us. Jesus said, “And if ye do always remember me ye shall have my Spirit to be with you” (3 Ne. 18:11). The sacrament is a great blessing in our lives. 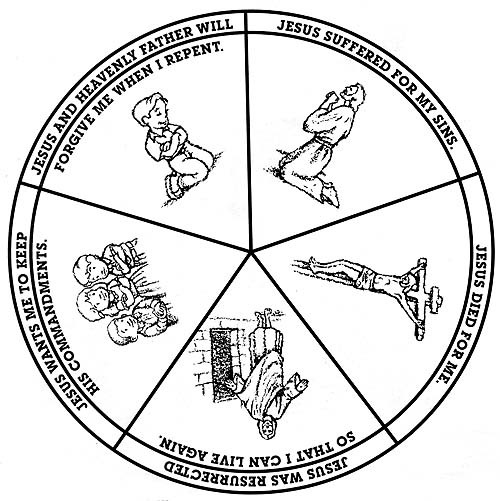 To help you remember Jesus during the sacrament, make this picture wheel. Cut out the two circles, and put the one with the wedge cut out of it on top of the one with the pictures. Fasten the two circles in the center with a brass fastener. During the sacrament, look at each picture and think about what it represents. 1. Divide children into groups and have them list stories of Jesus that they could think about during the sacrament. Draw pictures of favorites. 3. Show video Bible Stories for Children, volume 3, chapters 39–41, VHS VVVH2765. Discuss the purpose of the sacrament, what a sacrifice is, and what Heavenly Father and Jesus sacrificed for us. 4. Tell the story “A Great Blessing Comes with the Sacrament” (Merrie Miss/Blazer B/Course 11 manual, page 162). Have younger children pantomime proper ways to behave during the sacrament. 5. Sing songs about the sacrament as listed in the “Topics” section of the Children’ Songbook. The sacrament is a blessing, and we can show our gratitude for it by being reverent as the sacrament is being prepared and passed. Being reverent during the sacrament includes thinking about Jesus and what He taught us. By taking the sacrament, we show that we are willing to keep the commandments and always remember Him. Jesus Christ has revealed the ordinance of the sacrament on several different occasions. Cut out scripture references and pictures. Study the scriptures listed, then put each one with the picture that it tells about. Color the pictures and put them in the order in which you think they happened. At your next family home evening, use the pictures and scriptures to tell about the sacrament. 1. Make copy of this page for each child. Explain pictures one by one as children are coloring. 2. Discuss appropriate behavior during sacrament. 3. Read sacrament prayers (D&C 20:77, 79). Help children discover promises that they are making as they take sacrament. What promise does Heavenly Father make? 4. 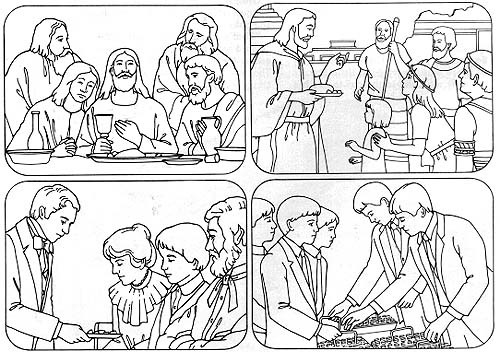 Enlarge each picture, and use to introduce songs, such as “The Sacrament” (More Songs for Children, page 16), “A Sacrament Song” (Sing with Me, C-1), “I Want to Be Reverent” (More Songs for Children, page 21), and “To Think About Jesus” (Sing with Me, B-55).